Having begun with a paper edition in 1904 in Huntington Beach and in the years since, we continue to bring you the news of the people and events that other media's bypass. In the pages of the Huntington Beach News newspaper we recorded the happenings of generations of our residents and in 1996 when we went to the web, continue to bring you the news and happenings of our city and it's people. With the advent of the Internet in the 1990s, we saw that it had the advantage of delivering the news faster to both in-town and out-of-town residents while continuing to stay independent of large media corporations. IE: Huntington Beach Wave> owned by the Orange County Register> owned by Freedom Communications. Huntington Beach Independent> owned by Los Angeles Times> owned by Tribune Publishing> owned by Chicago Tribune. 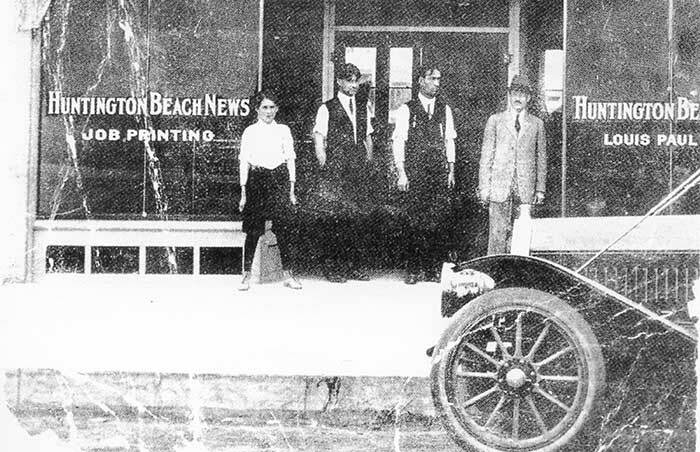 The Huntington Beach News will remain independent and has been since 1904. Ever since the first year edition was published in 1904, the Huntington Beach News has seen a long line of editors in those 100+ years. Beginning with U. Syd Lemon, editors have watched and reported the growth of Huntington Beach from a small beach town to a mega-city of today. For approximately six months U. Syd Lemon published the Huntington Beach News on a simple hand press with the type set by hand before turning the reins over to E.W. Hoag. In August 1996, the country became fascinated with something called the "internet" and it became clear to the staff that this was a way to deliver the news right now and so the paper edition was ended and the Huntington Beach News became the first local internet paper to report the news about the people and events in Huntington Beach. The Huntington Beach News is updated continually for the enjoyment of our friends living in Huntington Beach and abroad. The Huntington Beach News is not responsible for any contents or claims made in any story or cyber ad appearing on this website. Reproduction in whole or in part for commercial uses is strictly prohibited.